On a hot August afternoon in 2008, Ted Kennedy took John Kerry sailing on his 50-ft. schooner, the Mya.It was a perfect day on the water, sunny with the occasional cotton-ball cloud riding the strong winds over the family compound in Hyannis Port, Mass. With the Mya’s blue hull moving at a good clip, Kennedy turned to his old friend with reminiscences of failed campaigns past: Kennedy’s bid for the presidency in 1980 and Kerry’s in 2004. What concerned Kennedy, who three months earlier had learned he had a malignant brain tumor, was legacy  Kerry’s legacy. Not many people would have predicted this. There are some Democrats who will never forgive Kerry for his 2004 loss to George W. Bush, and nearly five years later it is still a sensitive subject for him. “We did pretty damn well against an incumbent President, under very, very difficult circumstances,” he prickles when asked about it. He took the loss hard. He skulked around the Senate for months, casting wary eyes on his colleagues and reporters alike. Friends say he talked in 2005 about leaving the Senate when his fourth term came to an end in 2008. Not until 2006 did he firmly declare he would seek a fifth term. By then it was clear that Kerry’s 2004 run left at least one enduring mark on American politics. On the wall of Kerry’s office hangs his invitation to President Obama’s Inauguration. In the center of the glass is a handwritten note from Obama. It reads, “I’m here because of you.” Kerry, of course, had picked Obama to deliver the keynote address at the 2004 Democratic Convention  the speech that launched Obama into superstardom. Kerry decided to endorse Obama in late 2007 and went public in early 2008. After Obama won, Kerry spent several weeks on the short list to be his Secretary of State  a job that ultimately went to Hillary Clinton. Kerry was disappointed, but he quickly buckled down. Lindsey Graham, a South Carolina Republican, had never had much reason to work with Kerry before this year. So he was surprised when Kerry approached him in the Senate about a month ago. “He came over to me, and he said he’d like to see if we could find some middle ground on global warming,” Graham recalls. 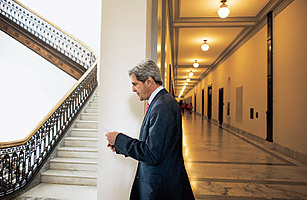 With California Senator Barbara Boxer, Kerry has been gathering Senators from both sides of the aisle for weekly meetings on climate-change legislation. The bill was thought to be a nonstarter in the Senate; Kerry is now confident he can produce a bipartisan agreement by late September. “I think he’s got a very practical approach,” Graham says. Kerry has also emerged as a problem solver on health care. The Obama Administration had rejected Senate Finance Committee chairman Max Baucus’ idea to tax some health-care benefits because it would raise taxes on the middle class. When Baucus’ panel came up $320 billion short of paying for its proposed reforms, Kerry suggested taxing insurers that offer high-end plans  those worth more than $9,000 a year for individuals or $25,000 a year for families  in order to raise $145 billion. It was an idea that he and then New Jersey Senator Bill Bradley, among others, had pioneered in 1994. When Kerry dusted it off this summer, unions balked, since many of their plans are worth as much as $25,000 a year. He convened some of the more vocal opponents last month. “I’m doing what Teddy Kennedy would do … I’m finding a compromise to get a bill passed,” he told the group. Kerry didn’t win them over, but they did pledge not to oppose the proposal. But it is as Foreign Relations chairman that Kerry has become most influential. A relationship with Syrian President Bashar Assad, forged in 2005, helped Kerry play the key role in thawing U.S.-Syrian relations after the White House renewed Bush-era sanctions on Damascus in May. With Lugar, he shepherded a $1.5 billion nonmilitary-aid package to Pakistan last spring. His support is also vital to Obama’s surge strategy in Afghanistan; though he voted to send more troops earlier this year, Kerry now wonders whether the Administration has a clear agenda there. “I’m very concerned about Afghanistan’s footprint,” he says. “The breadth of challenges that we face there, with police, with governance, corruption, narcotics, tribalism, other kinds of things … may be well beyond the narrower definition the President gave the mission.” Kerry plans to hold hearings in the fall, in part to force the White House to clarify its goals. See 10 elections that changed America. See pictures of Presidents at the beach. Sen. John Ensign: "I Had An Affair"